This book offers an interdisciplinary approach to the study of comic-books, mobilising them as a means to understand better the political context in which they are produced. Structured around key political events in the US between 1938 and 1975, the author combines analyses of visual and textual discourse, including comic-book letters pages, to come to a more complete picture of the relationship between comic-books as documents and the people who read and created them. 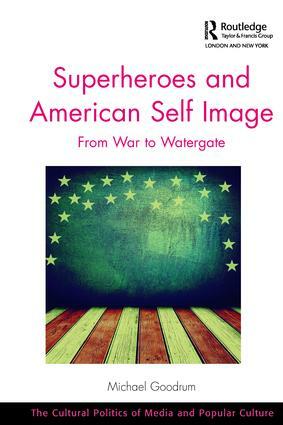 Exploring the ways in which ideas about the US and its place in the world were represented in major superhero comic-books during the tumultuous period of US history from the Great Depression to the political trauma of Watergate and the end of the Vietnam War, Superheroes and American Self-Image sheds fresh light on the manner in which comic-books shape and are shaped by contemporary politics. As such it will appeal to scholars of cultural and media studies, history and popular culture. 2. The End of the Second World War: What next for the US? 7. Vietnam, Watergate and the end of Consensus: What’s a Superhero to do? Michael Goodrum is Senior Lecturer in Modern History in the Department of History and American Studies at Canterbury Christ Church University, UK.